The mushroom is an important crop in many regions and countries. 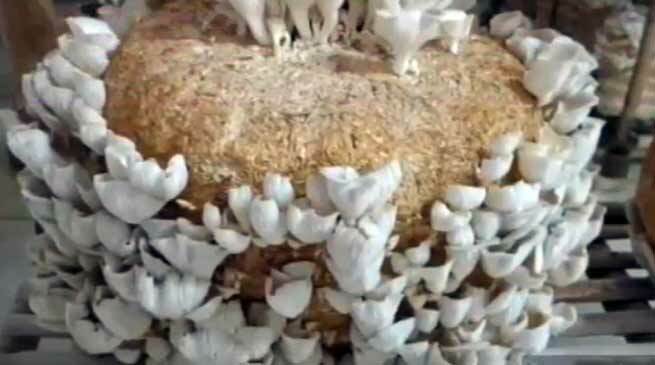 … Mushroom cultivation is a process utilising waste materials such as horse manure, chicken manure, pig manure, wheat straw, rice straw, corn cobs, wood bark, sawdust, and cottonseed hulls to produce a delicious and nutritious food. A ten days training programme on Production Technology of Mushroom began at the Department of Plant Protection, College of Horticulture and Forestry, Central Agricultural University, Pasighat, Arunachal Pradesh on Saturday. The beginning of the pragramme welcome address is given by Dr T. Shantibala Associate Professor, Entomology. In his inaugural address, CHF Dean Prof. B. N. Hazarika spoke about cultivation of oyster and other mushroom varieties for nutritional security and economic prosperity. He is also emphasised and check to local mushroom for eaten purpose. He promised to provide technical assistance to farmers, rural youths and school dropouts of the region on spawn production technology and processing of oyster mushroom. Senior entomology Professor Dr DB Ahuja presented hands-on demonstration on mushroom cultivation. Course Director and Principal Investigator Dr. R.C. Shakywar given introduction of the training programme and stated that mushroom is a new crop of 21st Century under Horticulture and having excellent nutritive values. He also briefed the house about spawn production unit at the department and initiatives taken up and sponsored by AICRP on Mushroom by ICAR – Directorate of Mushroom Research, Solan, Himachal Pradesh in promoting mushroom cultivation in the region. All together forty participants were participated from different parts of the Arunachal Pradesh. Lastly, the vote of thanks was proposed by Dr P. Raja, Associate Professor, Deptt. of Plant Protection.